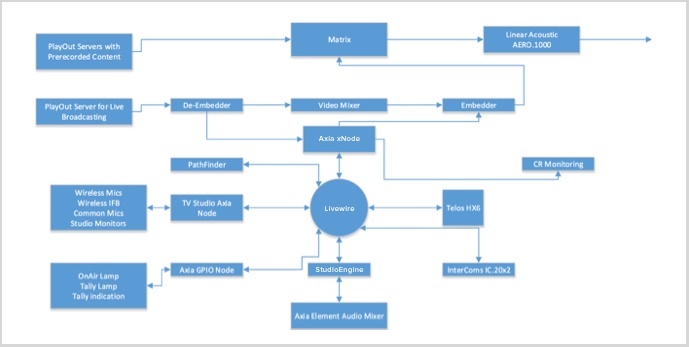 The flowchart below shows how RUTV integrated Livewire+ AES67 AoIP infrastructure into the TV facility. By placing an Axia xNode in the TV studio, only a single Cat 5 network cable is required to bring up to eight audio pairs into the master control mixer. The same cable carries eight audio pairs from the audio mixer back to the studio. Studio microphones, IFB, studio talk back and cue can all be handled on the single network cable. An SDI de-embedder/re-embedder allows audio from new clip server to be controlled on the mixer as well as a six-line studio telephone system, talent microphones and feeds from outside broadcast. Control room monitoring, studio cue, talent IFBs, and mix minus to telephones and outside broadcast are all handled using very few Livewire+ AES67 AoIP cables. Seeing Livewire+ AES67 Audio over IP work in a broadcast radio environment made the decision to use Livewire for television audio an easy one to make. RUTV has been using AoIP for six years already, placing them way ahead of most of the industry in recognizing the benefits of AoIP in the television environment.